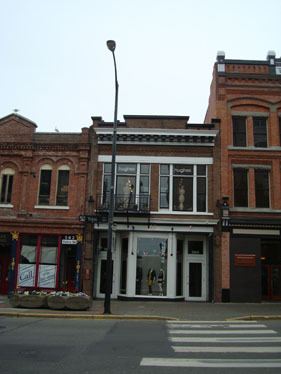 The building at 564 Yates Street has undergone several radical facade changes during its lifetime. It may be as old as 1860 – built as Nathaniel Moore’s Dry Goods Store – although the front facade dates from a renovation done in 1917 by C. Elwood Watkins. In 1909, shortly after the streetcar travelled by, it was renovated as the Majestic Theatre by Thomas Hooper. When the streetcar made its journey, the site was the home of the Women’s Christian Temperance Union – the voice against alcohol, ironically in the heart of the alcohol-consuming district.